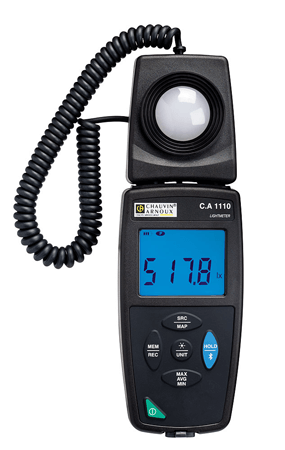 The C.A 1110 luxmeter (light meter) measures the illuminance of all light sources (LED, Fluo. etc.) up to 200,000 lux in compliance with Class C of the NF C 42-710 standard. With the MAP function, you can produce a map of a surface or room in order to check that the illuminance is uniform. Because it is magnetic, the sensor can be fixed to the product for one-handed use or for easy transport, but it is also possible to use it remotely to avoid shading by the operator. The C.A 1110 also offers Min, Max, Average and Hold functions, as well as allowing spot or programmable recording. 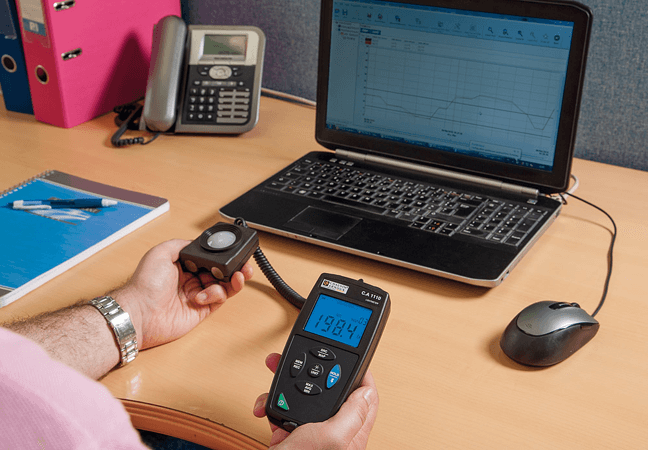 The Data Logger Transfer software is available for free download to view the recorded data, configure the C.A 1110, benefit from remote display and generate automatic reports.